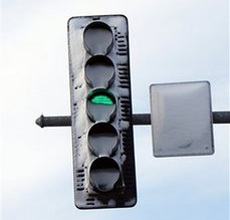 LED traffic lights have an overlooked problem in the snow, compared to traditional incandescent bulbs — they don't melt the snow. This has led to some accidents where snow piled up against the traffic lights. Old-school incandescent bulbs are inefficient and produce heat which melts the snow. But new LED lights produce very little heat, and so the snow blocks the lights.